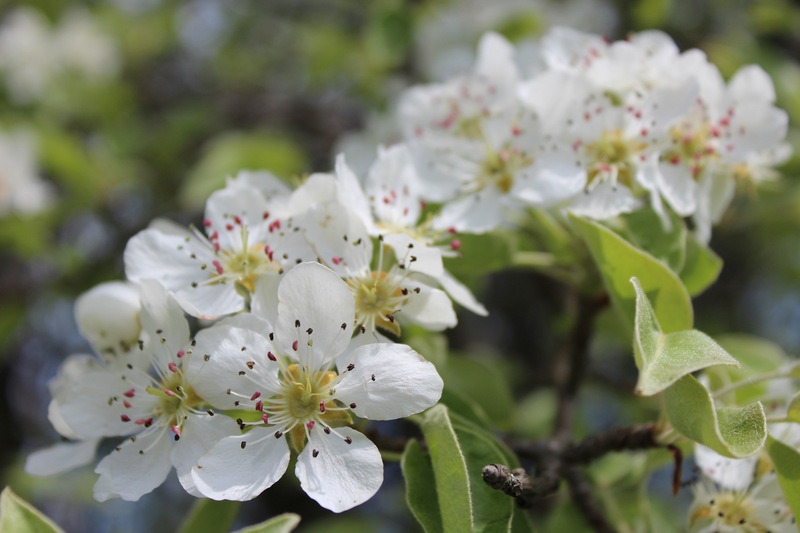 Pear tree blossoms are a welcome sign that spring is has arrived and lots of delicious seasonal flavours await. I used our last homegrown carrots last weekend. They were purple carrots–a variety called Starburst–that I dug out of the garden in January. I put them into a curry that got slammed into the oven so I could get back to transplanting Swiss chard. Hours later, those carrots were still pretty tasty, as was the curry. 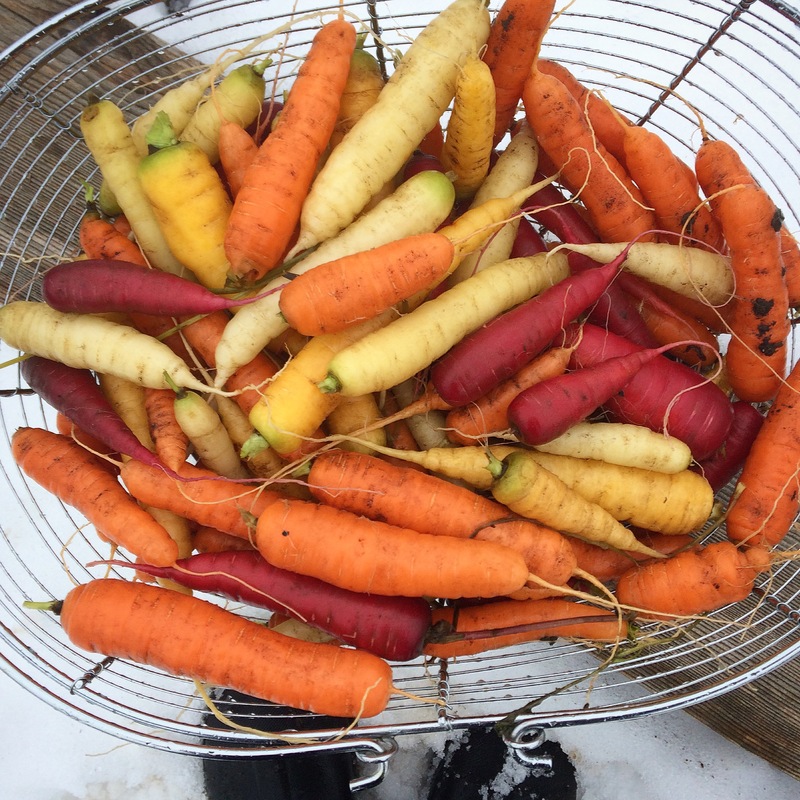 Carrots dug from the garden January 22, 2017. Deliciously sweet! Seasonal eating has been on trend for a while now. It’s something we are encouraged to explore to benefit our health, and the health of the planet. Growing most of our own vegetables here means we’ve really embraced seasonal eating. Maybe we are embracing it just a little too much, according to certain family members. I will replace “our” carrots with decent organic carrots I can get through the local food hub. But some things we don’t replace once they are used up. When the frozen pesto is gone, that’s it until the new crop of basil is ready. Fresh tomatoes are another irreplaceable seasonal delight. No hard, tasteless supermarket tomatoes are allowed in this house. Although, by the end of September, I’m ready for a tomato hiatus. So even though spring can be a time of using up the last of stored veggies, it is more importantly, a time for firsts. Special fleeting flavours that will be here and then gone. That’s the deal with seasonal eating. It’s a time to thoroughly over-eat certain things before they are no longer available, or tasty. Fresh asparagus is one of the best things about seasonal eating. 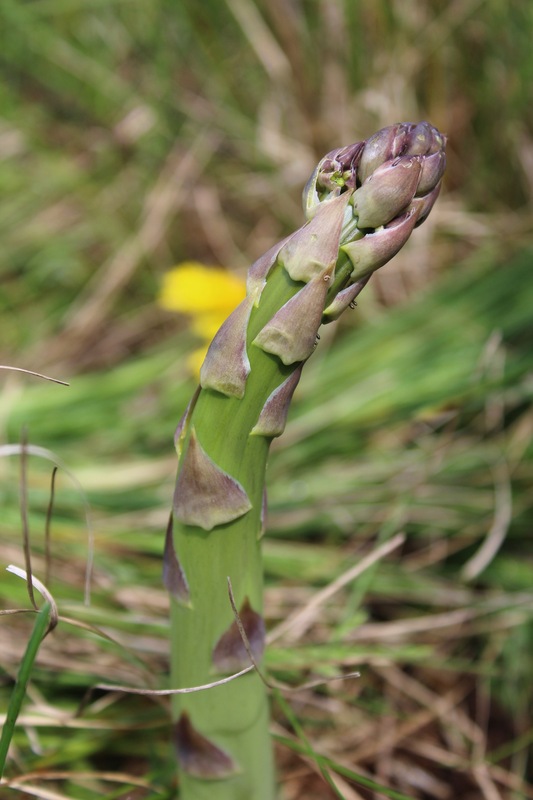 Guilty confessions of a market gardener : our little asparagus patch has become overrun with grass. Somehow, weeding the asparagus patch slips down to the bottom of the to-do list every year. Despite it’s sad state, the little plot gives us several yummy meals of fresh asparagus every spring. These we augment with local farmers’ asparagus crops. When it’s done, that’s it until next year. Happily, we are scaling up and improving our asparagus growing area, but it will be a few years until we reap the rewards. 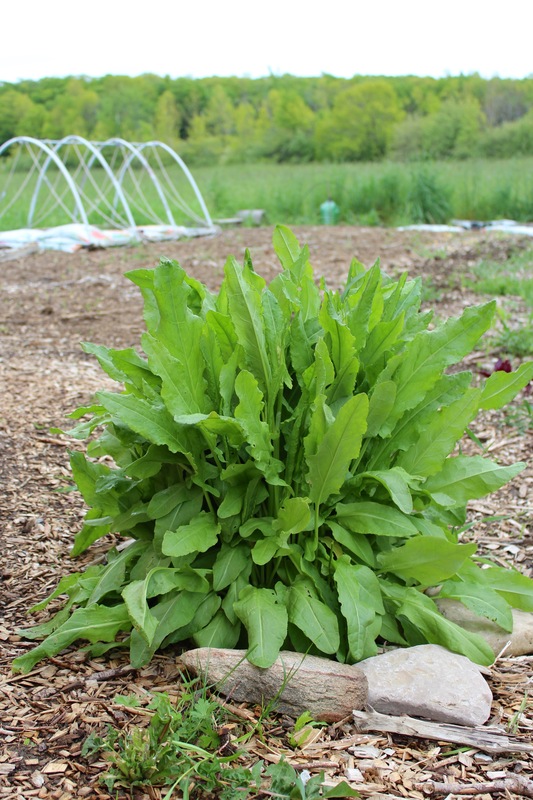 Despite many trials, this French sorrel keeps coming back. As a twenty-something, I first read about French sorrel in a book about herbs. It was written by an English herbalist; I was inspired by the picture of a cheese tart made with French sorrel leaves. This was my goal. 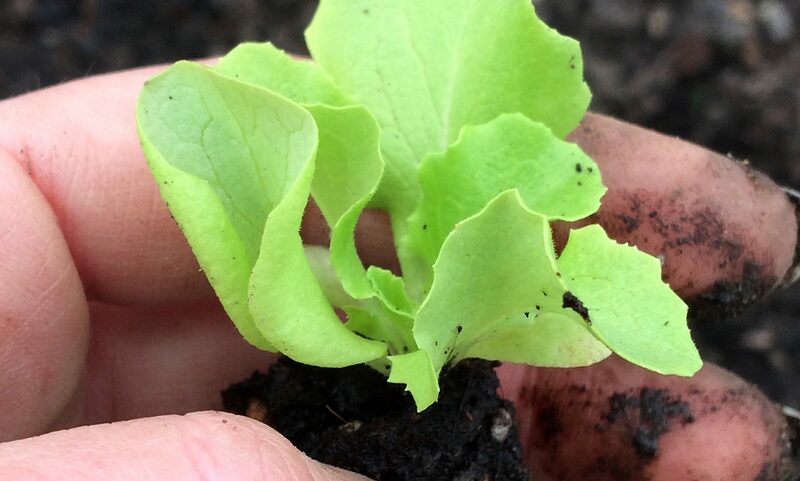 However, my experience growing French sorrel has had it’s ups and downs. The special fancy variety I ordered from a large nursery arrived upside down in the shipping box. I tried to revive it, but it was a goner. So I started plants from some non-fancy seeds which did very well for several years. Until they didn’t. So I transplanted one to the meadow, where it did well. Then we moved the chickens onto the meadow, and the plant didn’t do so well. Then we made a walking path over it and it disappeared. When my friend offered some sorrel thinnings from his patch last fall, I was thrilled. I was generously gifted lots of French sorrel plants that now edge one of the mulched beds. And guess who has has returned stronger than ever this spring in the middle of the path? What to do with all this sorrel, especially since tart-making is not in my wheelhouse? Vegetable Literacy by Deborah Madison to the rescue. I heard Deborah interviewed on The Splendid Table Podcast, probably either while gardening or making dinner. In that interview, I was impressed by Deborah’s knowledge of and love of vegetables, as well as her understanding of the miracle of growing those roots, tubers, leaves and fruit. We will be exploring a few of Deborah’s recipes to expand our use of this new-found French sorrel bounty. I’m especially looking forward to Creamy Sorrel Sauce over new potatoes. 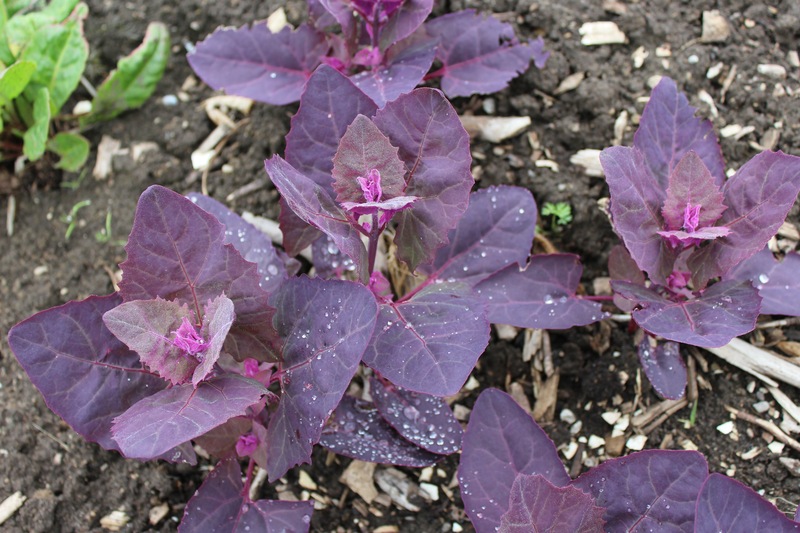 Growing well in the spring, these purple orach plants are self-seeding and pop up every year. This beautiful plant has been popular at the Wiarton Farmers Market this year. But there’s widespread agreement among customers that it needs a better name. Purple “orach” is just not a great marketing tool for this tasty seasonal treat. Being in the same plant family as spinach, I advise newbies to, “Treat it like a green, …except it’s purple.” Purple orach is delicious steamed and tossed with pasta, green garlic and butter. Be ready for your pasta to turn purple, though! We alway let several orach plants stretch up and produce a flower stalk and seeds for next year’s crop. They get a bit tougher and fibrous at that point but the goldfinches enjoy perching on them. I think the finches are helping themselves to the nutrients in those purple plants–they seem to favour them to all other garden perches. Now we’ll see how long we have to wait to replace those carrots. In the meantime, I think we’ll be fine. 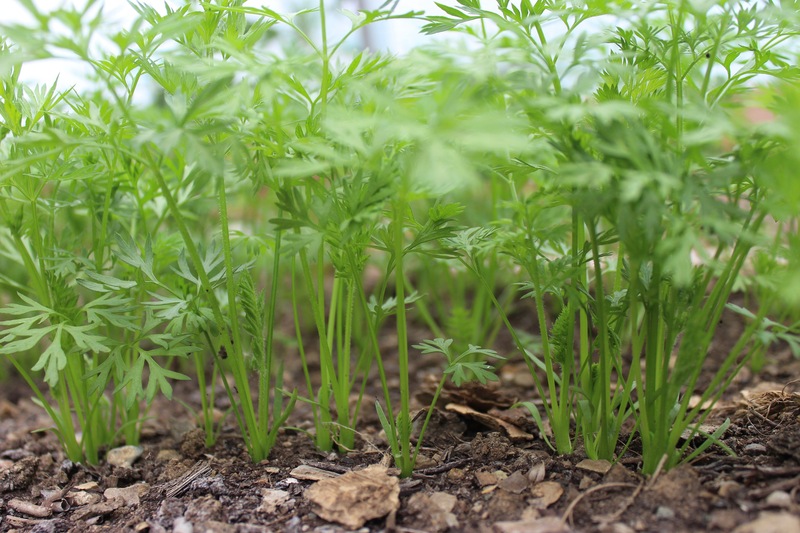 Carrot seedlings grow in the hoop house. We started these April 13th. Interesting information about several plants that we have never eaten. I will need to try them this year. Thank you for writing this blog.